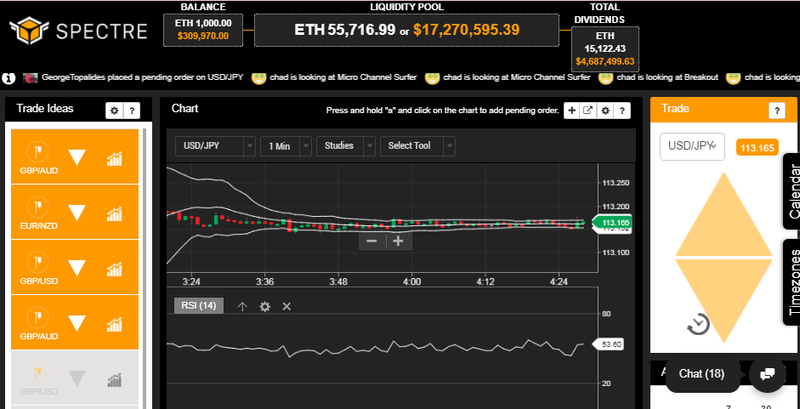 A financial prediction market platform backed by a tokenised liquidity pool. Using a liquidity pool to redistribute funds back to token holders is their broker-less platform advantage. 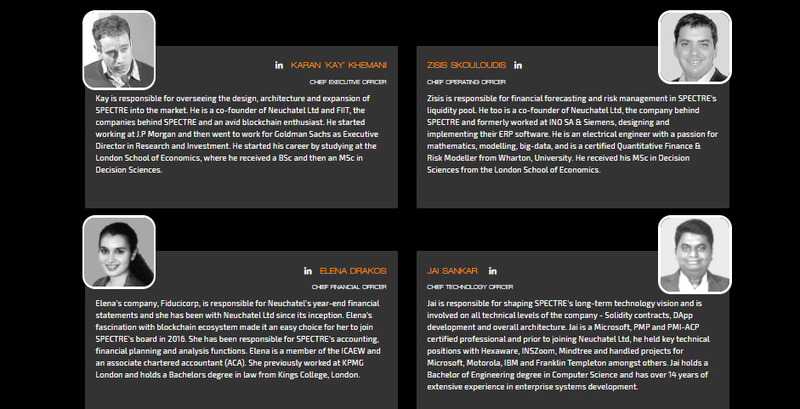 The team has enough qualified personnel to see the project through. Demonstration material is nice, but legal compliance to integrate fiat in platform will take more time than they suggest. Mass appeal efforts will likely diminish. 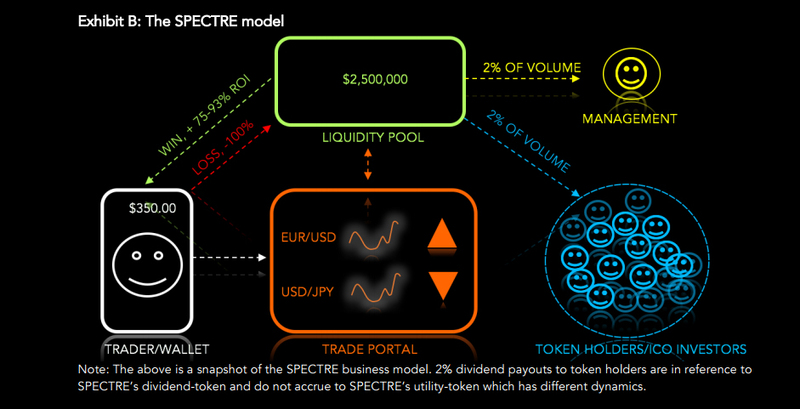 SPECTRE (short for Speculative Tokenized Trading Exchange) is the world’s first brokerless, financial trading platform with an embedded, decentralized liquidity pool that acts as a counter-party to all trades. 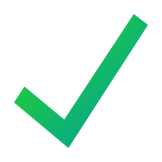 The liquidity pool is initially funded by an ICO and tokens are distributed to the investors in return. When trading, all transactions are governed by smart contracts meaning that the broker is completely removed from this equation as well. The smart contracts pay out 2% dividends to ICO token holders and 2% to SPECTRE as a technology fee, each time the trader takes a trade. This is different to the traditional broker models where brokers mostly get paid on trader losses. A result of all the above is the creation of a fully transparent and fair trading environment with no conflict of interest between involved parties; a provable fair battleground where traders can fairly trade against the market without intervention. By registering the business in the British Virgin Islands, Spectre can hide behind corporate anonymity. The micro-state tax shelter allows businesses to operate in a grey area. It won't be easy operating out of the shelter and negotiating with capital market laws. Not much consideration has been outlined to protect user data beside the simple DDoS statement from one of the Co-Founders. Spectre finds it's edge by creating a token pool to balance smart contract powered trades. The pool is essentially a crowd-funded margin account that operates as a method to improve transaction speed and decentralization protocols for handling funds. This broker-less model can prove to be a game changer over traditional transaction processing. Improvements in security must be made beyond DDoS protection and load balancing, additional measures should be taken to protect users privacy to ensure accounts are not compromised, suffering the same fate as Bithumb would inhibit future growth. It is difficult to invest in a potentially profitable exchange when you know the company's regulatory compliance is in limbo. Regulatory approval in major jurisdictions is an arduous process and likely won't be ready for the product launch as suggested by the time-line. By being unable to accept fiat payments and withdrawals at launch, targets may not be met and profit will suffer. Investing in this ICO is like investing in a dark room, it could be anything until you turn the lights on and check the closet.